After bidding good-bye to New York's brightest star, Elizabeth Holland, rumors continue to fly about her untimely demise. All eyes are on those closest to the dearly departed: her mischievous sister, Diana, now the family's only hope for redemption; New York's most notorious cad, Henry Schoonmaker, the flame Elizabeth never extinguished; the seductive Penelope Hayes, poised to claim all that her best friend left behind—including Henry; even Elizabeth's scheming former maid, Lina Broud, who discovers that while money matters and breeding counts, gossip is the new currency. My favorite part of the Winter Olympics is watching the singles figure skaters jump, spin, and glide their way to Olympic gold. My husband Toby's favorite part of the Winter Olympics is watching the singles figure skaters fall, especially when they fall at the end of an otherwise perfect skate. As they fall, he will shout, "OOOHHH!! DREAMS SHATTERED!!!" This has become a common phrase in our household, used in times of the utmost shock and distress. I'm telling you this so you'll understand exactly how upset I was when I shouted "OOOHHH!! DREAMS SHATTERED!!!" at the shocking conclusion of Rumors. I started Rumors immediately after finishing The Luxe, which I loved. I was afraid that Rumors would not be as good as The Luxe, but my fears were unnecessary. 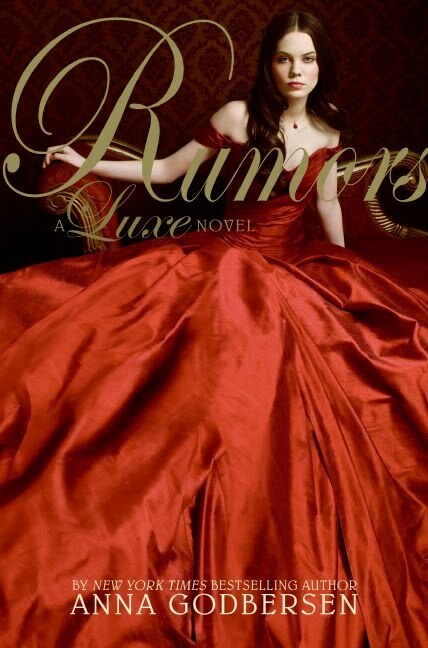 Rumors was just as good, if not even better (except for the ending). The story picks up about two months after the events of The Luxe. Elizabeth has gone to California, following her heart, and is making a new life for herself and Will. I loved seeing them together, it was so sweet. Diana is in love with Henry, and Penelope is still scheming, conniving, and grasping to get what she wants. Lina Broud cons her way into the upper echelons of society and seems determined to become one of the ladies she used to serve. I don't want to give away the story, but let me just say that I am still saying "DREAMS SHATTERED" to myself, days later. As previously mentioned, the shocking ending left me utterly heartbroken. The imagery, the love story, the social climbing, I love it all! I recently finished the 4th book in this series and while I thought the Elizabeth story line goes off into a wild tangent it ends nicely. I won't comment on Diana because that would spoil it! I did like this series a lot though! I like the dress on the cover. I'm reading Splendor right now and loving it! And I agree that the Elizabeth line is going off on a tangent, a very unexpected one at that! I have the 4 books in the series in my TBR pile but havent got round to them yet. Glad to see that you like them though!